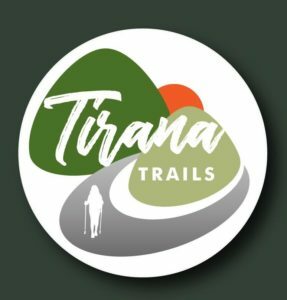 ‘Tirana Trails’ is a project by Tirana Ekspres, in collaboration with the Agency of Parks and Recreation of Tirana (APR), to build a network of trails around the city of Tirana. The soft hills, the ancient villages, the olive groves, the Mediterranean scents, the looming castles, the monuments, the caves, the forests, the lakes, and overall, the idyllic landscapes, offer an unused opportunity to build new social and economic prospects for rural and urban Tirana. 2) Create new socio-economic opportunities for the rural communities of Tirana. Other objectives include creating a culture for outdoor exploration, building of social cohesion, raising awareness and protecting the environment, and improving the image of Tirana. Tirana Trails will consist of a main trail that goes through the villages of Petrela, Mullet, Arbana, Ndroq, Peze, Vaqarr, Kashar, Paskuqan, Shishtufine, Zallherr, Linze, Farke, Lunder and completing the loop in Petrela. In addition to the main trail connecting these villages, many quality loop walks from these villages will lead to picturesque locations nearby. These locations are either historical/ archaeological (e.g. the Bride’s Tomb in Petrela, the Obelisque of Feti Vogli, the Faucet of Mamica, etc), or nature/ landscape sites (the Cave of Pellumbas, the Lake of Gurra, Vrapi Waterfall, the Eye of the Cyclops, etc). Tirana Trails will be marked and will have a branded signage system, with clear directions in Albanian and English. Local residents will be trained on services, hospitality, tour guiding, promotion, etc. APR will be in charge of maintaining and promoting Tirana Trails after it is built. As demonstrated in studies in Finland and in France the economic impact of trails is such that return on investment is manifold, going primarily to the public through taxes; the communities that trails touch prosper through income generated from the sale of food, equipment, lodging, tour guiding, etc. Trails are not only economically, but also environmentally sustainable. Although studies have not been yet done, similar success stories can be found in Albania as well: Peaks of the Balkans trail (especially the village of Theth), funded by the German Cooperation agency GIZ, and the Rural Inclusive Social & Economic Opportunities project, implemented by the environmental organization Milieukontakt and funded by the Italian-Albanian Debt for Development Swap Agreement. Beyond the main objectives, social cohesion will be an important element of the project; years of unevenly distributed economic opportunities and unrest have created huge socio-economic gaps between the different social groups, especially between rural and urban residents. Enabling human encounters, and giving the vulnerable groups such as women and youth new economic opportunities, will bring socio-economic progress to rural Tirana, and will help build a healthy social fabric of Tirana as a whole. 4. Promoting and marketing Tirana Trails. The first phase of this project will result in full mapping of the trails, and creating a simple website and mobile application. “Mapping Tirana Trails and making it accessible through a website and a mobile application” is supported through Embrace project, implemented by Partners Albania for Change and Development and financed by the European Union through the Delegation of European Union in Albania.